In 2015, 51.2% of our total potable water came out of the ground water basins, 37.4% was supplied by San Bernardino Valley Municipal Water District and 11.4% by West Valley Water District of its surface water entitlement. 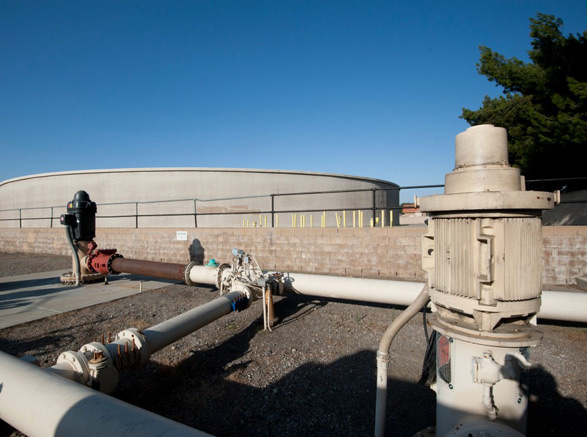 To ensure the ongoing safety and quality of the water resource, neighboring local public agency West Valley Water District is in direct partnership with the City of Rialto to lead all perchlorate remediation activities. It is important to know that Rialto Water Services does not pump water into its system that contained detectable levels of the Perchlorate contaminate. We currently have wellhead treatment on two of our wells for the removal of perchlorate. This wellhead treatment removes the perchlorate to a Non-Detection Level. The other two wells affected by perchlorate contamination have been shut down, are out of service and have not been used since detection occurred. These wells are targeted for wellhead treatment in the near future. The mission of Rialto Water Services is to provide quality water and wastewater treatment to City residents. Visit our Customer Service page to Pay Your Bill, Start New Service, or learn more about our Service Line Protection Program. Our team doesn’t just lecture – rather, provides hands-on experiences for students through a variety of programming designed to educate and inspire. Maybe your child or student is one of this country’s next water and wastewater professionals! Rialto Water Services is owned by an affiliate of Ullico, the nation’s first labor-owned financial services company, and Table Rock Capital, and is committed to the long-term success of this groundbreaking arrangement.